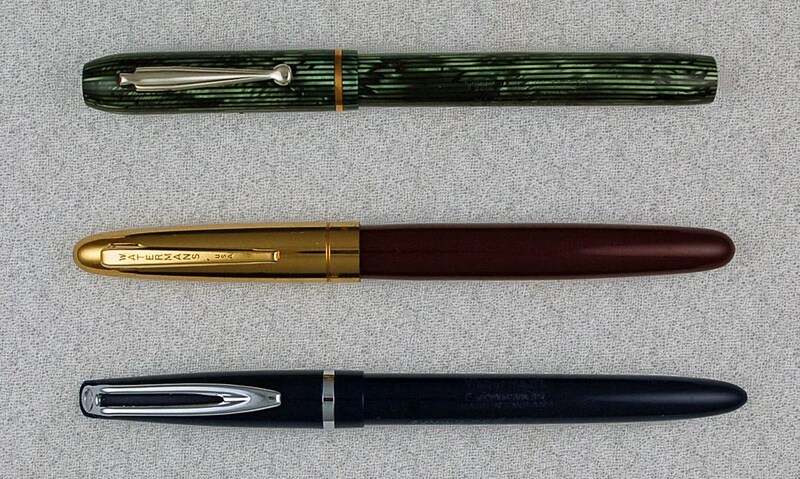 Waterman Skywriters were produced by Waterman over quite a span of time. They were first produced in Canada under the Waterman and Aiken Lambert name. Waterman had purchased Aikin Lambert in the 30s and these first Skywriters used both names. See this link for excellent Skywriter information. These were produced from sometime in the late 30s into the 1940s. Interestingly, the name Skywriter was capitalizing on the rising popularity of air travel. Other Pen Companies had also done this as evidenced by the Wahl Eversharp Skyline and the Sheaffer Skyboy. (follow links to previous posts on these pens). I have been looking for a decent example of a “First Generation” Skywriter for quite some time, and recently was able to work out a deal for two examples. Below is a photo of the two pens after I took them apart. The brown pen came as a set and I have included the mechanical pencil. This was an interesting restoration for a few reasons. First, as you can see the brown Skywriter has no clip. Secondly, what you cannot see is that the green Skywriter has a replacement Sheaffer nib. After cleaning it, I discovered that it is a Sheaffer 33 nib, which fit perfectly into the section/feed. I cleaned all of the components above – the worst being the brown cap. It had many layers of dried ink. I also replaced both size 16 sacs and cleaned out the sections, which are both visualated. The resulting pens (and pencil) are below. They measure 4 15/16 closed and 6 3/8 inches open. Though the same size, you can see the subtle differences in the designs. The cap banding and barrel ends are different. However, the levers, sections and feeds are the same. Here is a closeup of the Aikin Lambert (US) nib that was on the brown pen. I replaced it onto the green pen, which is the more complete pen, having an appropriate clip. The Imprints of the two first generation Skywriters are identical, as you can see below. What is interesting to me is that they were both made in the United States. 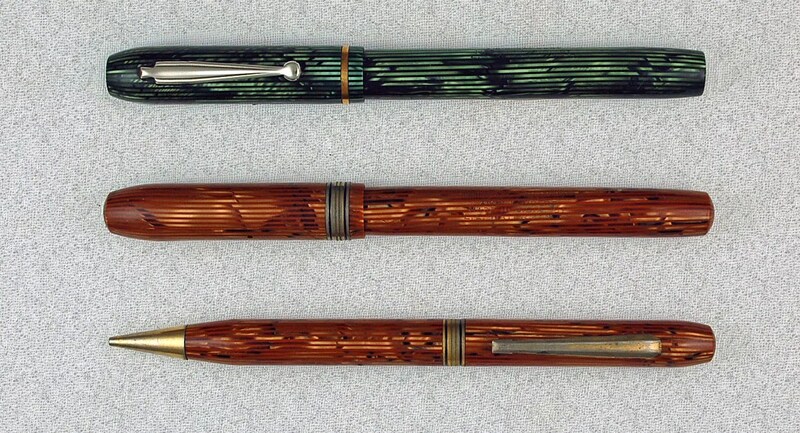 Much of what I have read of these pens is that they were produced around the time that Waterman purchased Aiken Lambert in the late 1930s. Further, most information points to pens being produced in Canada. Obviously, production was also occurring in the US, as these two pens point out. I have seen many of these in similar stripe patterns as well as marble plastic patterns. From top to bottom – First, Second and Third Generation Skywriters. It seems to me that there are not too many pen models over the years that have endured this many drastic design and production changes. Many have had various generational differences, but few this dramatic. By the time the third generation occurred, the pen had changed into a CF clone, and production had moved across the Atlantic Ocean! As with the later Skywriters, little advertising exists for these Canadian and US pens. Nonetheless, they are interesting collectibles, just like their younger versions. In my post of March 1, 2012, I wrote about a gold and burgundy 2nd generation 1950s Skywriter and its restoration. This week’s pen is a similar Skywriter, but in Silver trim and red in color. Remember that the first Skywriters were produced under the Aiken Lambert name after Waterman had purchased them. These appeared several years later in the late 40s and 50s. Several colors existed and this pen is an example of a different trim option. You can see that the pen came apart without too much effort. Be careful when removing the sections of these pens as the plastic is quite brittle and can crack easily. I used a heat gun for quite a while before the section finally released. You can see that it is a friction fit and that the old sac was detached from the section and had dried up. 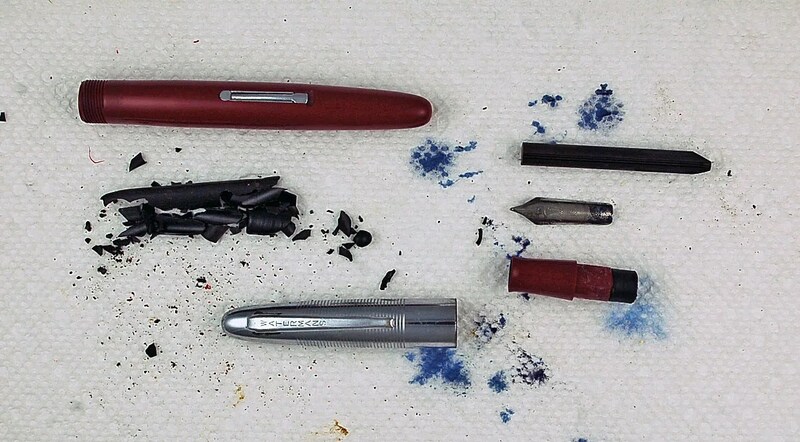 I cleaned the nib and cap in an ultrasonic cleaner, removed the old sac from the section and cleaned the section and feed, removing the old ink from the inside of each. I attached a size 14 sac to the section and allowed it to sit overnight. The next day I placed the section / nib / feed into the barrel and the resulting pen is below. The pen measures 5 1/8 inches closed and 6 1/16 inches posted. Below, you can see the pen from the March 1 post underneath this pen. Differences are the trim, nib color, and the letters USA appear on the clip. The Skywriter spanned a few decades and many of these low priced pens can still be found today in varying models and configurations. Interestingly, very little information exists on them. Waterman did not highly advertise them or catalog them, probably due to the fact that they were an entry level pen. If anyone has any written material in the form of advertising or catalogs on these lines, I would love to see it! These are surprisingly hearty pens that perform well for inexpensively nibbed pens. I will be on the lookout for further variations. See also Waterman Third Generation Skywriter, dated just last month. I first wrote about Waterman Skywriter’s in my post about Waterman 2nd Generation Skywriter’s, dated March 1, 2012. As you may recall, the second generation Skywriters were produced in the early 1950s, capitalizing on the popularity of air travel, and similar to the efforts of the Sheaffer Skyboy, and Wahl Eversharp Skyliner. Waterman followed up the second generation effort with the pen below. You can see from the exploded view that it is a standard lever filler with a size 16 sac. 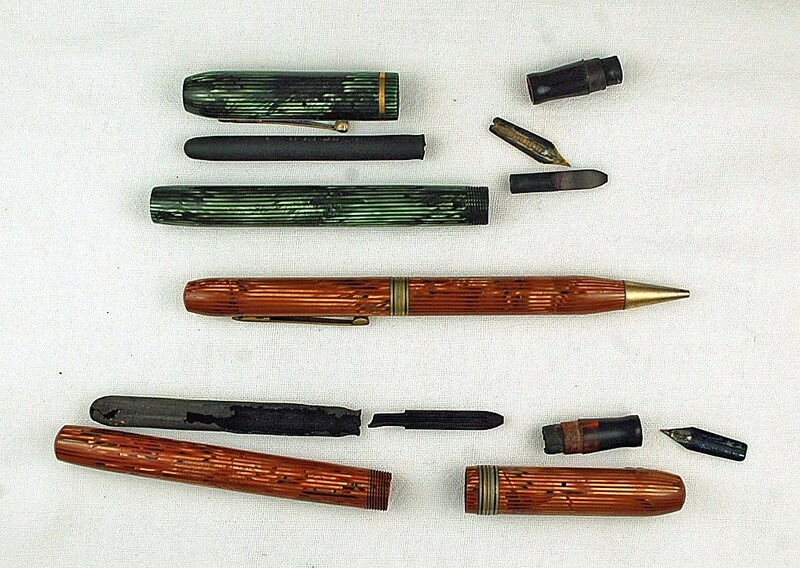 Note the nib/feed/section assembly is typical of the Waterman pens of the period. I have found that it is more prudent to simply leave these together and run them through an ultrasonic cleaner, instead of taking them apart. The nib sits deep in the section, and the risk of cracking the section is great. Typically, as with this pen, there is not a lot of built up ink and the section cleans up easily. So, all I had to do was clean the section unit, polish the nib, and install a new size 16 sac to the section, after trimming it to the small barrel length. Below is the restored Waterman Skywriter, measuring 5 3/8 inches closed and 5 3/4 inches posted. The main difference in the two pens is that the C/F is, of course, a cartridge filler, and the Skywriter, a lever filler. I look at this mid to later fifties Skywriter as a blend of the open nibbed Waterman’s such as the Crusader, and the C/F. Here is a photo comparing the last two generations of the Skywriter. Similar in size, but very different in form. My feeling is that the quality has been reduced even more with this model, compared to generation 2. An unexceptional English 14 carat nib is part of this pen, not labeled with the Skywriter name, as with earlier models. I have seen some third generation models with Skywriter nibs, and wonder if this is original, or a late replacement. As with the second generation, very little, if any, advertising information exists on these inexpensive pens. For the collector, they are an interesting sidelight, even if of lower quality. I have recently acquired a first generation model, and after restoration, will post further information. Stay tuned….. This week’s pen is not an expensive or highly sought after collectible, but an interesting corner of Waterman, and fountain pen, history. 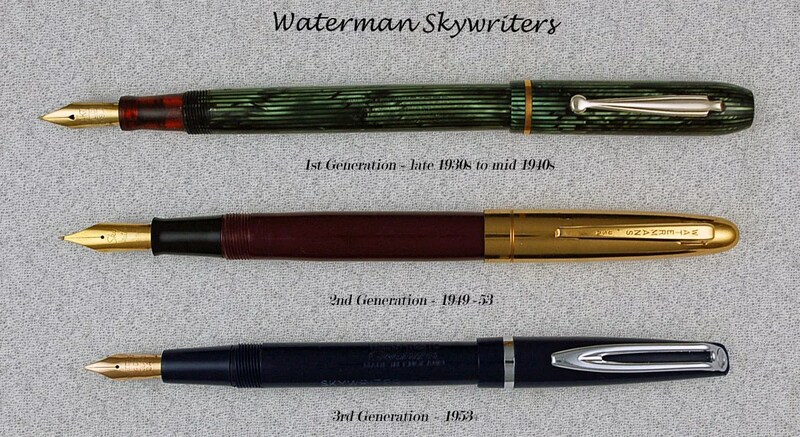 Waterman Skywriters were produced by Waterman over quite a span of time. They were first produced in Canada under the Waterman and Aiken Lambert name. Waterman had purchased Aiken Lambert in the 30s and these first Skywriters used both names. See this link for excellent Skywriter information. These were produced from sometime in the late 30s into the 1940s. The second “generation” of these Skywriters were produced by Waterman in the 1950s and are represented by this restoration pen. Produced mostly in the 1950s, they were primarily a chrome adorned lever filler, but this one has gold filled cap, lever, and nib. A third generation was produced in the 1950s and resembled the Waterman C/F (cartridge filler), but was still a lever filler and had an open nib, not a C/F type nib. The second generation Skywriter below had normal wear to its parts. As you can see, it came apart fairly easily with the assistance of a little heat. The nib and feed knocked out of the section, and the original sac had separated from the section, needing to be replaced. The section, feed, and nib were cleaned up and a new size 16 sac was fitted to the section unit. I buffed out a few scratches on the barrel and polished the cap and nib as well. The finished burgundy / gold pen can be seen below. It measures 5 1/8 inches closed and 6 1/16 inches posted. 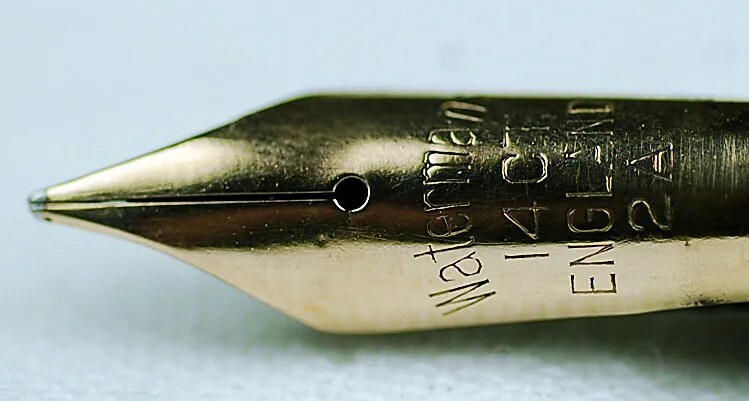 Below is a photo of the gold plated M – 24 Sky Writer nib. For those looking for a low priced, reasonably made, fountain pen…. this is another pen to think about finding and restoring.